Richard Donovan The Inca Trail Marathon is much more than a race. It’s a nine-day trip into history, a rich cultural experience, and a holiday in a mind-boggling beautiful paradise. We learn that when Spanish conquistador Francisco Pizarro invaded the Andes and seized the Inca emperor Atahualpa in 1532, he demanded a room full of gold as ransom. We see the places where ensuing events unfolded. We view amazing ruins surrounding Cusco - the ancient capital of the Inca Empire, we hear our native guide tell us of past and current customs, we visit bustling markets, we are welcomed into people’s homes, we eat in the best places and stay at the top hotels, we camp out on the Inca Trail, we are spoiled all the time…and the only payback is race day. This annual event is organized by Devy Reinstein of Andes Adventures, a California-based travel business that specializes in adventure trips to South America. 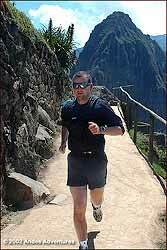 Devy is a former competitive ultra runner of note and accompanies the competitors each year in the Inca Trail Marathon. The race itself, which follows the Inca Trail to Machu Picchu, covers a distance of 27.5 miles, and the terrain, altitude and ascent make it extremely challenging. Most hikers take an average of at least three full days to complete the route but we all set out to run it in one day. On August 8th, we assembled at our starting line on the Inca Trail. We comprised a motley crew of various ages, abilities, backgrounds and goals. Among the starters was Nancy Drach, a member of the USA 100k team a couple of years ago. She has run 50 miles in 6 hours 38 minutes. Her husband David, also in the race, has run more ultramarathons that I can count (100+). Also at the start: Gordon ‘Grun’ Smith from Virginia, a 2:39 marathoner; Abelardo Vignati of Peru, our knowledgeable guide who has covered the Inca Trail on hundreds of occasions; organizer Devy Reinstein, one of the most conscientious race organizers on the planet; Greg Andress of Texas, a martial arts expert with a 3 hour marathon time, Scottish lassie Louise Port, a veteran of adventure ultramarathons such as the Himalayan 100-Mile Stage Race and the Marathon des Sables; Ted Braggans, well on the way to his goal of completing a marathon on all seven continents; and the hardy Tacoma, Washington brigade of John Wagner, Janine Duplesis, Phyllis Welker and Max Welker. Of course, I was at the start too, not only because I wanted to see Machu Picchu since I was at high school, but because I wanted to run an ultramarathon in South America. I’m a 36-year old from Galway, Ireland, who is hoping to run an ultramarathon on each of the seven continents in 2002. Although the Inca Trail race distance of 27.5 miles barely qualifies as an ultramarathon, the tough conditions and the importance of the Incas in South American history definitely made it the most appropriate race for my South American leg. At this juncture, I had already run races at the South Pole (Antarctica) and the North Pole (the North Pole is not on a continent but in the Arctic Ocean), as well as an 87k ultra in Sydney, Australia. So here I was at the start, having spent a few days acclimatising with the others at an altitude of about 11,000 feet. The previous evening we set up camp at 8,600 feet beyond an archaeological site called Llactapata and we prepared ourselves for a race starting time of 5.30am. We were furnished with maps of the route and advised by Devy of the location of two aid stations that would be on the trail. Once the race began, I decided to pin my colors to the mast, so to speak. I opted to run hard from the outset in the hope of breaking 6 hours for the Inca Trail. It didn’t take long, however, for me to realize why this event had a formidable reputation. Over the first half of the course lay three mountain passes of between 12,000 and 14,000 feet and some very steep ascent before each of them. En route to the first pass at 13,779 feet, known as “Pass of the Dead Woman”, I traversed over a spectacular gorge and viewed magnificent snow-capped mountains. Running through mossy woods and thick forest before emerging above tree level, this section of the trail was extremely challenging. In the five miles immediately preceding the first pass, the ascent was almost 1,000 feet per mile. The sheer altitude, coupled with the uneven and steep steps that characterize the Inca Trail, reduced my breathing to short, abrasive gasps. On many occasions, my hands were clasped fast to my thighs as I literally attempted to pull my legs up over the steps. Periodic stops to catch my breath became more frequent as the journey to the top seemed endless. I looked behind occasionally, only to see the highly experienced David Drach keeping me within striking distance. Despite feeling quite ill the day before the race, he had the appearance of a man who was running within his comfort zone and I certainly was not. I scrambled onward, thinking of him as the cop in Terminator 2, with his steady, relaxed running motion and total concentration. On reaching the top of the pass, I barrelled downhill as fast as possible before beginning the ascent to the next pass at 13,100 feet. Glaciated peaks littered the horizon, but the constant pressure to move forward prevented me from stopping for long to admire the view. Shortness of breath returned as every ounce of my energy was used to reach the top of the second pass. Glances over my shoulder revealed that none of the other competitors were within immediate sight and I once again descended with pace down the rocky slopes, hoping that my ankle wouldn’t twist and put me out of the race. It required absolute concentration. Yet, it was both humbling and astonishing to see local porters keep pace at times, clad in old pairs of sandals and carrying heavy loads. Along the trail, now consisting of even levelled stone-pavements, I entered dense groves and Inca tunnels before encountering a superb stone staircase leading to the ruins of Phuyupatamarca or “town in the clouds”. Upon summitting the third pass, I picked up pace again, being nevertheless careful not to lose my balance and tumble into the deep gorge of the Urubamba River. Passing down a series of hundreds of steps, which took their toll on my legs, and running by amazing ceremonial Inca baths, I descended into cloud forest. Along this section of the course, there was a notable increase in temperature that was reflected in the abundance of varieties of exotic plants, orchids and flowers alongside the trail. For those interested in any running activities on the Inca Trail, I would not hesitate to contact Devy Reinstein at / Tel: 310-395-5265 or to check out http://www.andesadventures.com , but I would equally advise you not to hurriedly ask about a Double Inca Trail Marathon unless you are well prepared!